This is a phrase we have heard time and time again. The truth is, we don’t actually care how old you are! We don’t discriminate. We employ people who have a 2:2 degree or above and simply just bloody impress us. The more background you have, the more that excites us! It’s what makes people interesting. This blog is about one of our latest recruits – Alasdair. We feel that his story is inspiring and if you’re sitting on the fence, wondering if you’re too ‘old’ for The Grad Scheme, or you don’t have any experience in finance, so you don’t think you’d be any good, we believe that after reading this blog we will have changed your mind. Who’s Alasdair and what’s his background? 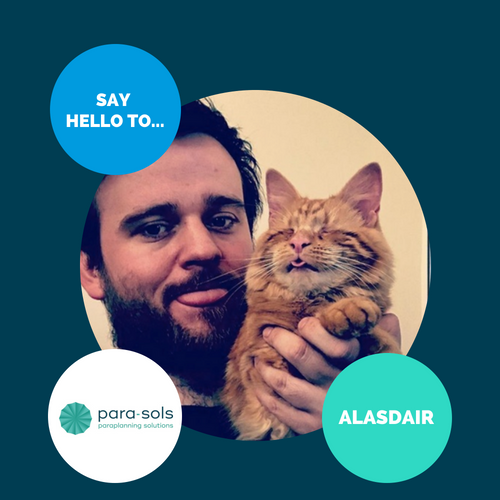 Alasdair is the latest recruit to join The Grad Scheme, he’s that new, he’s not even on the Meet the Team page on Para-Sols, (he will be soon, don’t worry). He graduated in 2012 from the University of St Andrews with a degree in Geology. From then he went straight into a career teaching A-level Geology/ Geography at multiple colleges in and around the North East of England. Unfortunately, only a small proportion of 16-year olds go on to study A-levels, meaning that there are naturally fewer jobs going. This meant that although he was teaching, it was only part time because of the short demand and because of this, Alasdair also had to do bar work in the evenings in order to cover the bills. In 2015 he received his PGCE from the University of Teeside. Truly putting his all into his teaching efforts, there was still not enough demand in terms of a full-time job becoming a fixture in his life. After 5 years, Alasdair came to a hard decision of admitting that his career was hardly progressing – therefore, he decided that the best thing to do would be to embrace a change in career. Knowing that his career wasn’t progressing at the pace he would have preferred, Alasdair decided to take the plunge and start searching for a new career – a brave move after 5 years in teaching. After trailing through job sites searching for the perfect new role, he came across The Grad Scheme – a paraplanning role is something in which he had looked at previously and this seemed like the perfect opportunity to act on it. Although he did receive some “you graduated ages you, you can’t apply for that” comments, he didn’t listen to that, and thank goodness he didn’t! “It feels like the best decision I have made for my career – I am finally in a role where I can see a future progressing. The Grad Scheme is structured in a way where you are clearly told what you need to do to develop and achieve to the next step, plus you are supported the whole way. Employees at Para-Sols come from all sorts of backgrounds; some straight out of university, some who have also changed careers after realising their initial choice wasn’t for them (like me), so don’t let age/ time since graduation put you off – I was almost 28 when I applied! If I hadn’t made this move I would still be in limbo with my career, something no one wants. It doesn’t matter what degree you hold! Graduates here hold degrees in a wide variety of subjects, (one even has a Zoology degree!) so don’t assume you won’t be successful without prior qualification or experience in finance-related subjects or experience, because that isn’t the case. As long as you have a forensic style of research and impeccable writing skills, you’re already on track.